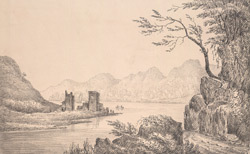 Sketch of Urquhart Castle on Loch Ness in Scotland. The castle originally stood 50 feet above the level of the loch (the water was raised when the Caledonian Canal was built) and was one of the most imposing and strategically important castles in Scotland. It stood on a rocky promontory surrounded by water with a clear outlook across the loch ensured that this vital communication and supple route was protected. The stone castle as built by Alan Durward in the 13th century but a fortification had stood on this site since the 13th century. In the early 16th century John Grant refurbished the castle adding a hall, chamber and kitchen as well as a tower which can be seen with the gatehouse in this print.